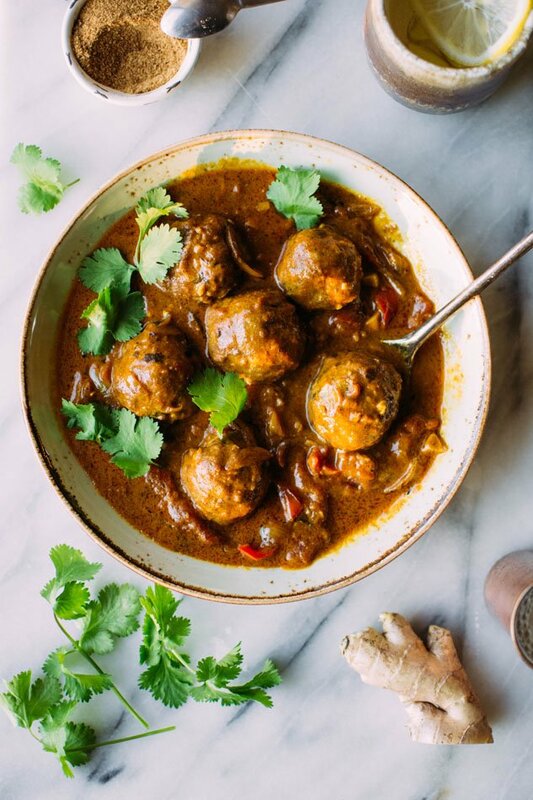 When I made these best ever paleo curried pork meatballs last week, I had no idea I was gonna fall this hard. Talk about food-crush! These babies are pretty near perfect. Just the right amount of spice and flavor that’s nicely mellowed out with a healthy dose of full fat coconut milk. 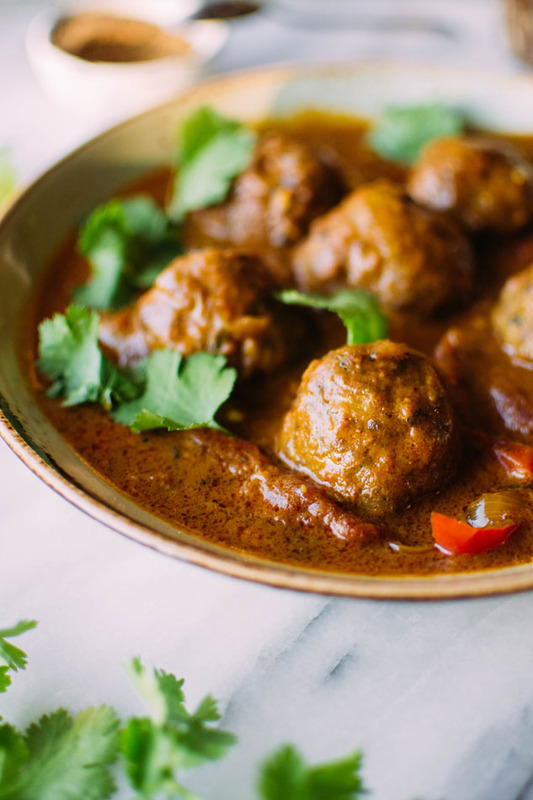 They’re tender yet sturdy enough that they hold up to the curry sauce, and packed with flavorful ingredients like fresh cilantro, garam masala spice, onion and ginger. We loved them so much that I didn’t even get to my photo shoot before more than half of them were gone. It was a time span of about 12 hours. Okay we miiight have a meatball-loving probem. So don’t be deceived by the 6 cute little meatballs hanging out up there. This recipe actually makes a lot – about 18 or so depending on what size you make them. Perfect to be shared with friends or family, or tucked away into the refrigerator for a stellar lunch line up for the week ahead. 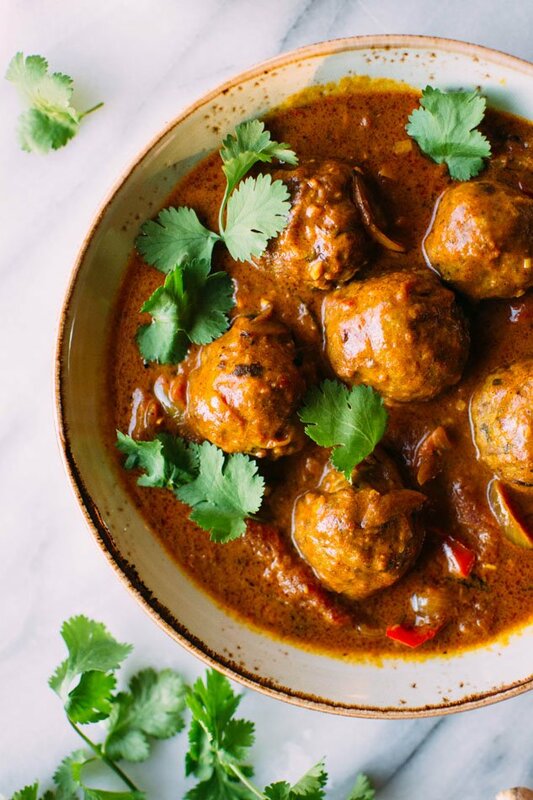 The first one providing most of the flavor inspiration, and the second one helping me nail that whole paleo meatball thing. Who knew adding a tiny bit of baking soda could do so much for a meatball. We enjoyed these with a little bit of quinoa, and garnished with lots of cilantro and some roasted cashews. The cashews didn’t make the photo shoot but they add a lot to the dish and I would highly recommend including them! 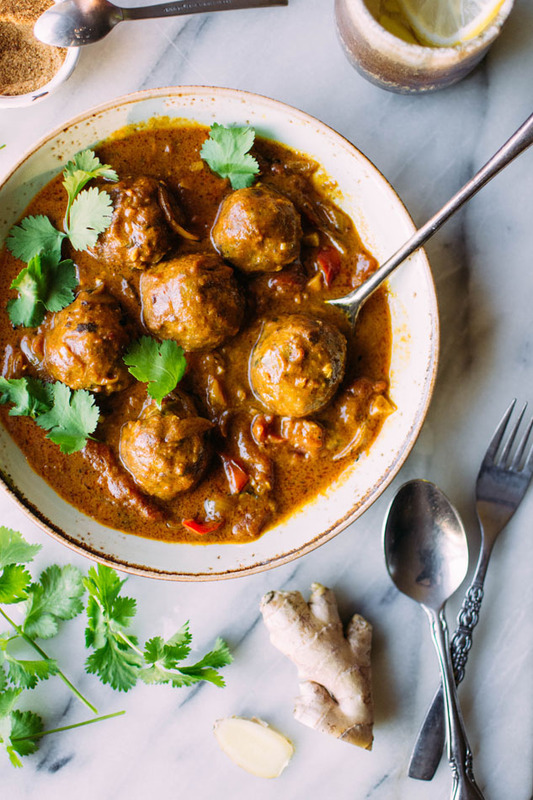 These perfect pork meatballs would also be awesome over some cauliflower rice, roasted cauliflower florets, or some vegetable noodles. 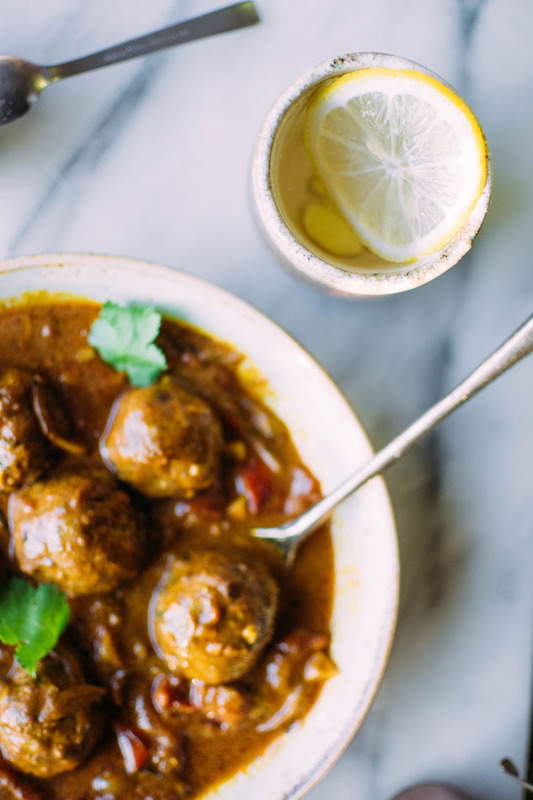 Best ever paleo curried pork meatballs! 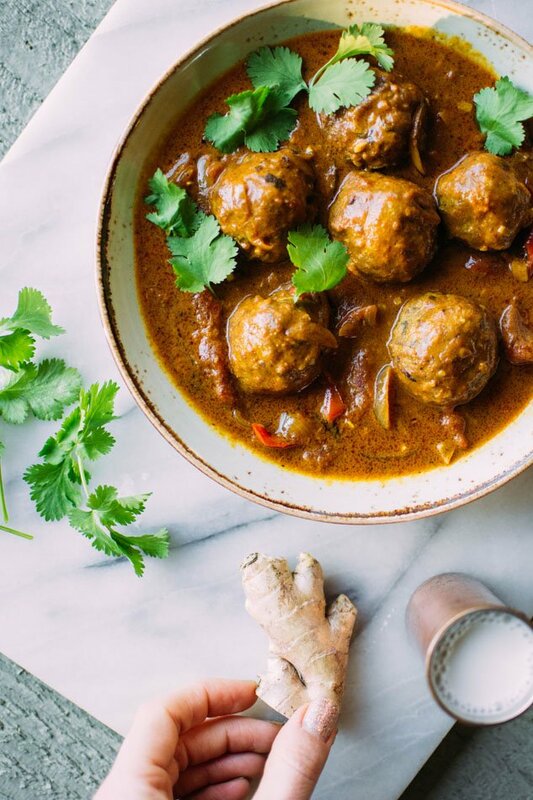 The most delicious grain free meatballs I’ve ever had. 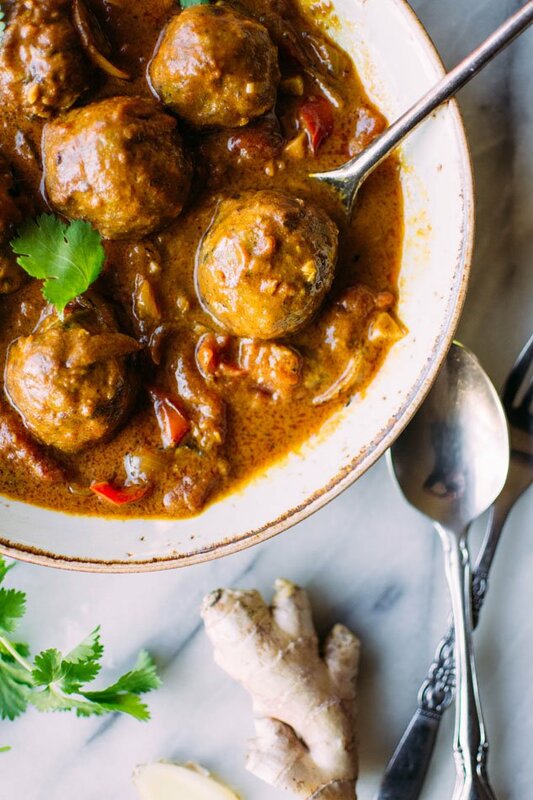 Perfectly spiced, sturdy yet tender, and paired with an incredibly flavorful curry sauce with red peppers, tomatoes, onion, garlic and ginger. 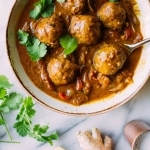 Mix all ingredients for meatballs together in a large bowl, using your hands it you don’t mind doing that (it’s easier to mix evenly than by using a spoon). Test for proper seasing by frying a little bit of the meatball mixture in a pan. Add more salt/coconut sugar/pepper/garlic powder if desired. Roll with wet hands into 1 1/2 inch meatballs. Bake, about 1 inch apart on a large, parchment lined, shallow baking sheet for about 20-25 min, or until starting to brown. While meatballs are baking heat 1 tbs avocado oil in a large sauce pan over medium heat. Sauté onions for a few minutes until starting to brown. Add garlic, ginger, curry paste and turmeric and cook 1 minute more. Add tomatoes, breaking up with your hands or the back of a spoon and use liquid to scrape up any browned bits on the bottom of the pan. Stir and cook for about 3 minutes. Add 1 can coconut milk, broth, sliced red peppers and bring to a simmer. 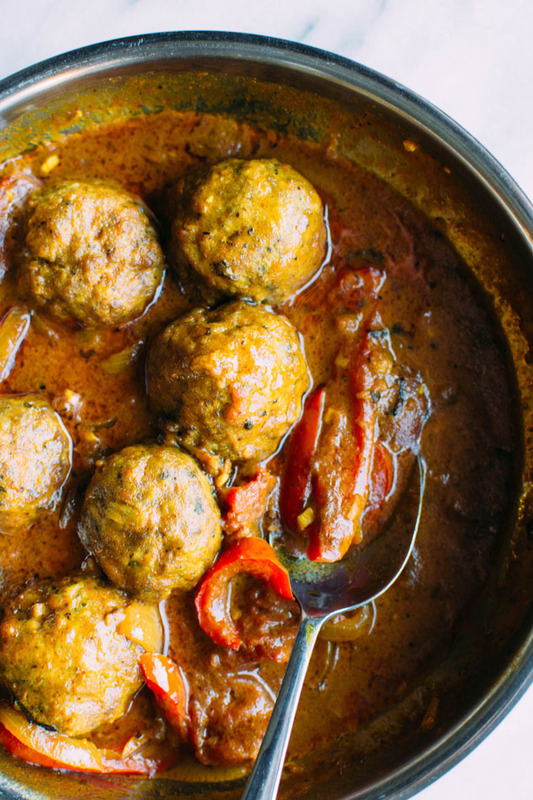 Move meatballs from baking sheet to the sauce pan and stir to coat in sauce. Cover and cook on low heat for about 15 minutes, until vegetables are tender and meatballs are cooked through. Season with lemon juice, coconut sugar, and more salt if needed. 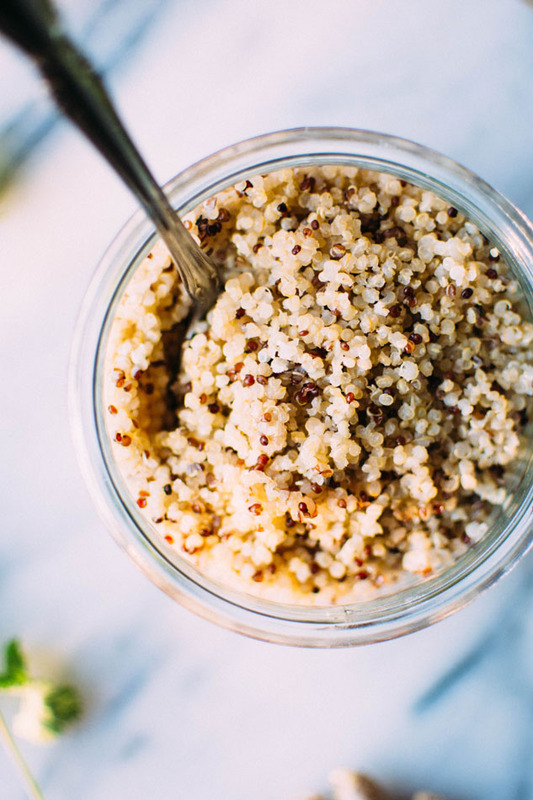 Serve garnished with plenty of cilantro and roasted cashews, over quinoa, roasted cauliflower florets, cauliflower rice or vegetable noodles. This entry was posted in dinner and tagged cilantro, easy, gluten free, grain free, healthy, paleo, pork, spicy on January 30, 2017 by Nyssa Tanner.